An all-terrain vehicle is made for rugged terrains and tough riding conditions. With a focus on durable performance and maneuverability, ATVs from Can Am offer the best balance of rugged ability and control for safety reasons. We offer a diverse selection of Can Am ATV parts to help your vehicle achieve its full potential with every ride. Whether you need spark plugs, bearings, or fuel pumps, we have you covered with all the essentials and then some! When looking at the history of innovation of Can Am overall, it is clear to see why this manufacturer is a fan favorite for ATVs. Founded in 1942 under the name BRP, the company began by producing motorcycles and would then branch off into snowmobiles before taking on ATVs. The BRP company now oversees Ski-Doo for snow riding, Sea-Doo for personal watercraft, and Can Am which covers their ATVs and side by side vehicles. The Can Am ATV lineup offers all the rugged performance features expected for off road terrains while still offering design elements to make the rider smoother and more enjoyable. With elements of design focused on work capabilities such as a 750kg towing capacity in select models and rear and front racks with LinQ attachments points as well as multifunction gauges, it is no wonder these rugged machines are a popular choice for work ATVs for jobs of all different sorts. If you choose Can Am for non-work related purposes, there are still plenty of manufacturing elements to get excited about for recreational riding such as the front arched A-arms, sway bar, and revised wheel space of their newer models with offer a wider stance for a more confident handling over tough terrains, as well as the use of independent rear suspension which offers leading traction for a better overall control. Designed with a focus on grabbing the terrain for incredible control and stability, their models also feature elements such as Continuously Variable Transmission (CVT) technology for a more responsive gearing void of repetitive shifting while a focus on engine braking ability has made it easier than ever to slow down while going downhill. The bottom line is that Can Am is responsible for creating some of the most reliable and rugged ATVs on the market today for both work and play. 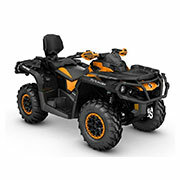 We are honored to offer a diverse selection of Can Am ATV parts for your shopping needs. With a focus on offering everything you need all in one convenient location, we bring you an inventory spanning a wide range of years, from 1999 to current options, as well as a complete lineup of Can Am models and series within the model. We understand the importance of getting the right part in terms of size, fit, and overall specs to ensure proper performance and longevity for your machine. Whether you are shopping for the Outlander or the Renegade, we have you covered with all the top models and series to match your year. You also need a diverse spectrum of part types available to ensure a well-maintained vehicle. With our selection of Can Am ATV parts, we cover every possible aspect of your ATV from top to bottom and bumper to bumper. Whether shopping for a connecting rod screw, crankshaft, or a battery bolt kit, our inventory ensures you will find the right solution for the job. We aim to make shopping easier than ever in an increasingly complex world. For example, to find the right part, simply select the year of your model, the name and series of your model, and the system you are shopping for to locate a diagram of the parts needed for that system. You can also search by part number if you have it available for another easy shopping option. In addition to the ease of online ordering, we also focus on fast, easy shipping to add to the hassle-free experience. With a network of delivery handlers, including USPS, UPS, and FedEx, get your order with ease and speed so you can make the necessary repairs to your machine. Best of all, every option we offer for Can Am ATV parts is made with high standards of excellence for a quality product. With a focus on bringing you OEM parts direct from the manufacturer, you get products made to offer the same fit and function of the original from when the vehicle was first manufactured. This ensures a performance as close as possible to the intended performance of a new vehicle.